WARSAW – NorthWood needed a pick-me-up, and got it from one source and from another unexpectedly. No. 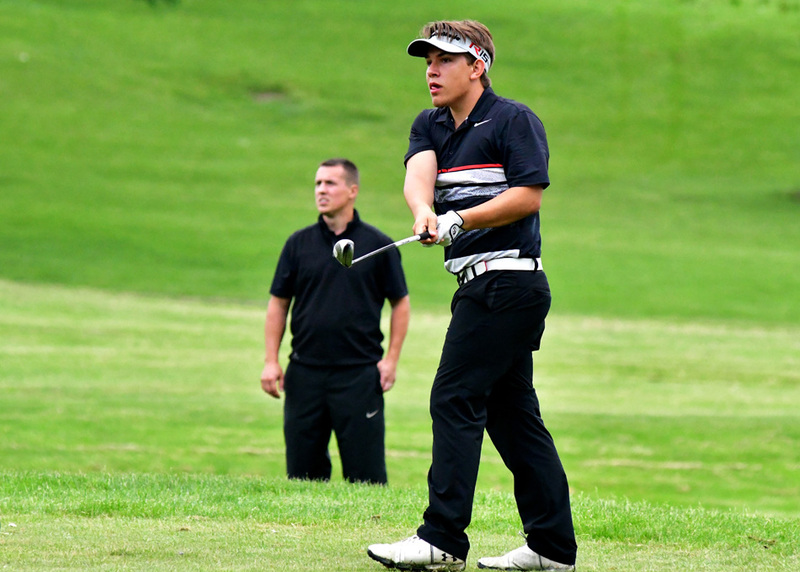 1 Panther golfer Caleb Lung was the cream of the crop, while No. 4 Jacob Falk had the round of his season. 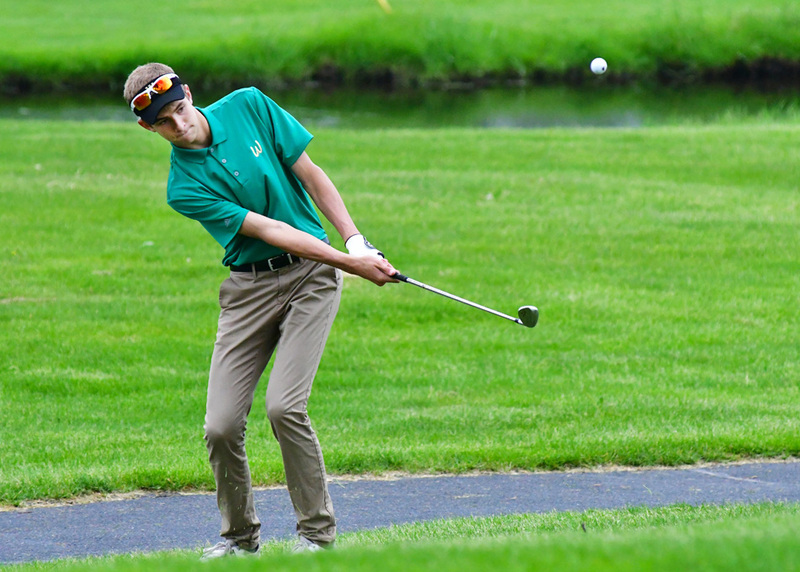 Combined, the two helped push the Panthers to a 320 team score, besting Warsaw by two to win the Northern Lakes Conference Boys Golf Championship. Battling the early elements without showing much affect, Lung worked the Rozella Ford course like a pro. Firing a 36 on the front nine, Lung added a 40 on the back to finish at 76. That score tied Plymouth’s Chapman Yoder for top mark of the tourney. On the one-hole playoff, Lung’s sent his tee shot went well wide of the fairway and his second shot missed the green. Lung wound up with a bogey on the hole, but Yoder had his own troubles. Landing his second shot over the green and to the right, his chip rolled past the mark and off the green. The Plymouth No. 1 couldn’t get his second putt to fall, leaving a second playoff hole rolling just off the edge of the cup. NorthWood’s Caleb Lung was the individual medalist at Saturday Northern Lakes Conference Boys Golf Championships. Falk’s score was not only his best of the year, but very necessary. 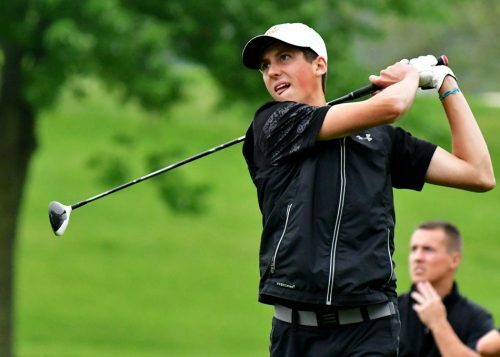 Falk tied Warsaw’s Luke Delp for third overall in the tournament, and an 80 from Sean Hogan matched Warsaw’s next-best score of 80 by Sam Yeager. However, the Tigers posted an 81 from Chase Byron and 82 from Jake LaLonde for its four scorers while NorthWood’s fourth was an 85 from Randy Kauffman. With both Warsaw and NorthWood coming in at 6-1 in the regular season round robin, the tourney winner would get the title. To get that second score in the 70s was the difference, noted Warsaw head coach Rich Haddad. Warsaw’s Sam Yeager watches his drive on nine set sail. The part unseen in all the action Saturday was actually a 168 shot Thursday night. Wawasee posted that score at South Shore Thursday night to defeat Warsaw by one stroke in their dual. The team loss, which moved Warsaw to 6-1 instead of what most expected to be 7-0 after defeating NorthWood earlier in the season, was crucial. As Wawasee fell way off the pace with a 370 Saturday, Haddad noted accountability is the only thing to point to in getting wedged out of the title. Wawasee’s 370 landed them in sixth overall, a little disappointing for coach Steve Coverstone after the team finished 4-3 in the round robin and had the Warsaw win to its credit. 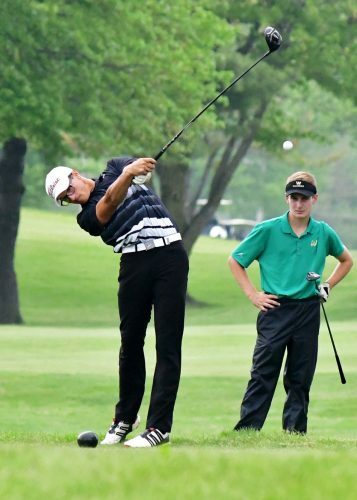 Zach Leedy paced the Warriors with an 87, Evan Dippon had an 89 and Dillon Drake finished at 91, but Wawasee then dropped to 103 with both Jared Krugman and Victor Tayagua carding the same total. “Some of the kids came up here (to Rozella) last night and played pretty well. That’s the danger of coming up from the day before and playing the golf course, because you set a standard and then you have to come back and try to beat it. It’s hard to do sometimes. Concord and Plymouth tied for third in the championship standings with 326s, Concord getting the nod on the fifth-man score. Northridge (363), Wawasee (370), Goshen (375) and Elkhart Memorial (406) wrapped up the team ledger. Jake Eakins and Matt Auger of Concord finished in the top 10, Eakins tied for third at 79 and Auger tied for sixth at 80. Bryce Carmichael of Plymouth tied for ninth at 81. Wawasee’s Evan Dippon chips on hole eight at Rozella.